The Sailing and Kayac Sant Pol-Costa Brava school offers you the chance of enjoying kayaking and discover the wonderful views of the Costa Brava. We offer you several options; the most advisable one is undoubtedly our kayak excursion. To do a kayak Costa Brava excursion, there is no prior experience in the use of canoes, we have double kayaks and individual rotomod, They are easy handle kayaks, as they have a good stability that makes them easy for everyone without prior experience. Anyway, before starting the activity, you will receive an explanation about the management of kayak, the techniques of rowing and you will be trained on the basic notions in order to be able to handle the kayaks with all the guarantees and security. If you choose the option of the kayak + snorkel excursion “on the route we will make a small stop to make a snorkel and a bath in this way you will be able to see the fauna of the Mediterranean, we can see different fish as well as sea urchins and if we’re lucky we’ll find seastars and octopus. We have two routes, one towards Sant Feliu de Guíxols, in which we will discover small coves or different caves such as the bat’s cave or the owls cave. The other route is towards Platja d’aro in this route we can discover the corner of the Gavina the sunken boat, la punta d’en Pau and Cala Pedrosa. 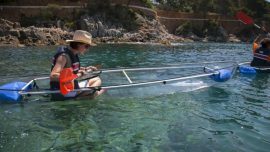 If you choose the option of transparent kayak, we will use completely transparent kayaks, That way we won’t lose sight of everything that is under us. Thanks to these kayaks, you can cover a greater distance with less effort thanks to its narrow design and longer stretch that offers less resistance to water. Sea kayaking is a variety of individual or double canoeing mainly for sports. 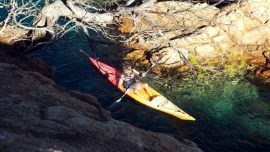 Sea kayaking will provide direct contact with the marine environment, the possibility of discovering the most spectacular and inaccessible corners of our Costa Brava. Join and try the sea kayak, it is the best way to see the coastline close by, discover by yourself all the beauty you can only see from the wáter. Don’t let anyone explain it to you and book your Kayak Costa Brava activity.